Sundanese Alphabet is one of the Indonesian cultural heritage. The preservation of Sundanese Alphabet is a task that should be done by Indonesian people as one of the ways to protect the existence of Sundanese Alphabet, one of them is by knowing kinds of Sundanese Alphabet which are divided into 4 parts, such as Ngalagena, Pangwilang, Swara and Panyora. The implementation of Information Technology (IT) is a must to be done as the innovation to get all kinds of information. 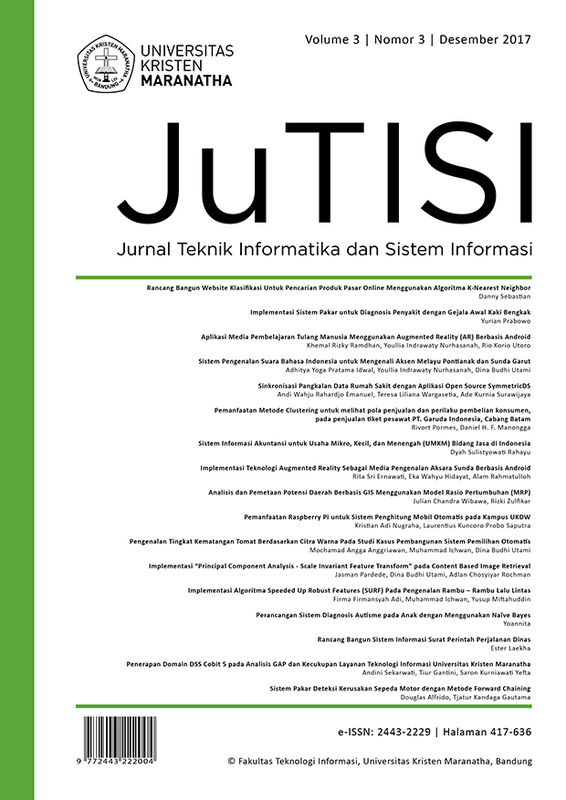 The Efforts to introduce the Sundanese Alphabet is by making an application based technology Augmented Reality, therefore in this research, is created an application of Augmented Reality based on Android by using Marker-Based Tracking. The model system to support this research is by using Luther-Sutopo version, who says that six steps (Concept, Design, Materials Collecting, Assembly, Testing, and Distribution). The results of this research are the application that has been made can show 3D of Sundanese alphabet object that will appear in 4 different markers. Based on the results of survey assessment to this application is 93% on very strong criteria, so this application can be accepted well by the users.